"The most workstation for your money." 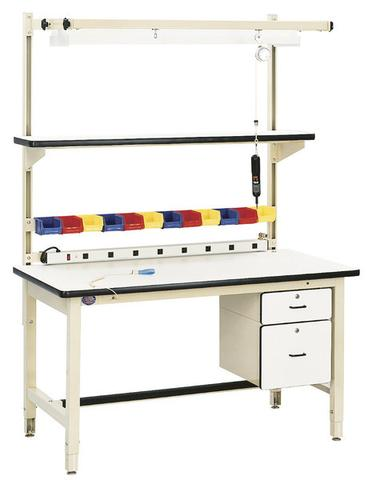 The aesthetics of the Model HD combined with the heavy duty, independent four leg design and the almost infinite selection of modular accessories have made this model the workbench of choice for production and lab areas at almost every Fortune 500 company in America. With an unbeatable price vs. quality, you cannot go wrong with our most popular model. 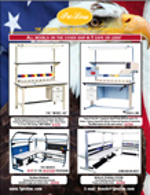 Available as an ESD bench by adding optional ESD (electrostatic dissipative) laminate surface. Standard height is 30." Additional cost per station for other, special order heights: Change last two numbers on stock number to the special height desired. Be sure to add the Top Color and Frame Color to your ordered item. Get A Rise Out of Your MODEL HD Note: Order our HDLE-6 Leg Extension Kit for your Model HD Station. Allows up to 6 inches adjustment, in 1 inch increments. Bench is moved up on the extension and bolted through frame holes. Stock No. HDLE-6, Weight 4 lbs., call for cost. The Leg Extensions are an IN STOCK ITEM. Tool Balancer, tools up to 1 lb. Tool Balancer, tools up to 2 lb. Tool Balancer, tools up to 5 lb. Use our Build-a-Bench interactive app to get a quote now. To learn more about all of Proline's products, download your catalog today! Browse through over 40 years of previous ideas and orders here.